The body of John George O’Neill on the river bank at Crawley. Front page of The Sunday Times, 6 April 1924. The murdered man at the wheel of his Buick motor car in which he later lost his life, The Sunday Times, 15 June 1924. Detective Sergeants Purdue (right) and Kennedy at the crime scene. Mirror, April 12 1924. George William Auburn, the accused, stepping out of the police van at the start of the trial. The Sunday Times, 15 June 1924. Miss Helen Josephine Sadler, Auburn’s girlfriend and Crown witness, in conversation with a clerk from the defense team. The Sunday Times, 4 May 1924. George Auburn leaving court on the charge of murder. Front page of the Mirror, 19 April 1924. Mr and Mrs George Auburn with Mrs Auburn’s daughter, ready to depart for the South-West in their mobile hairdressing salon. The Sunday Times, 22 August 1948. 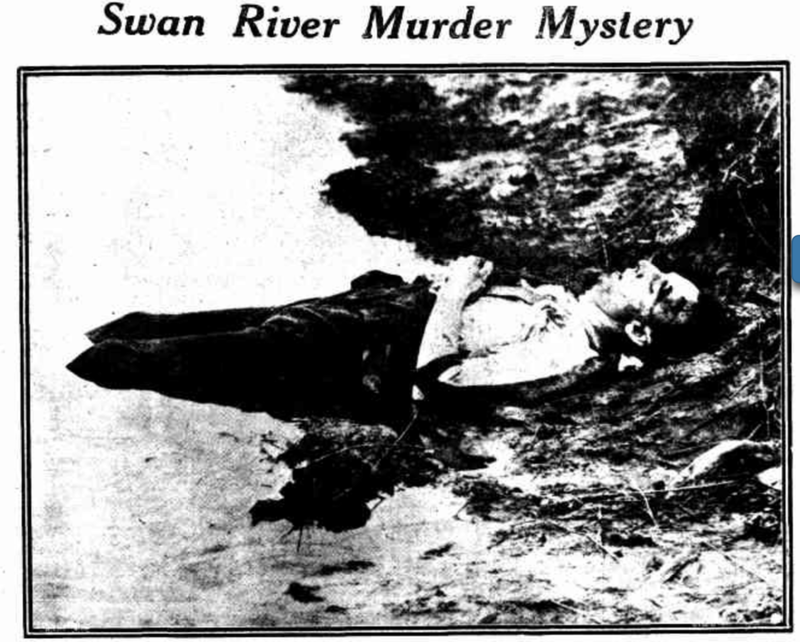 On 4 April 1924, a battered body is found in the Swan River at Crawley with wounds to the head so severe that pieces of the skull penetrated the brain. The brutal crime sparks a public frenzy which is fueled by florid newspaper reporting and sympathy for the murdered man. Police Commissioner, R Connell, offers a reward of £500 for information that would lead to a conviction. A free pardon is extended to any accomplice who supplies information, provided that person did not commit the crime. John George O’Neill (27), from Subiaco, is the owner-operator of a grey Buick taxicab which he drove for customers out of the Murray Street rank. He is described as a good husband and citizen, recently married, with no known enemies, and an ideal family man. On the evening of 4 April 1924, he was expecting to pick up a party on St George’s Terrace with supplies sufficient for an eleven day trip to the South-West. The next day, his battered body is pulled from the Swan River at Crawley and his grey Buick is found abandoned in Vincent Street, Leederville, splattered with blood. George William Auburn (21), of Osborne Park Hotel, is arrested on 16 April 1924 while riding a motorcycle, and is charged with the wilful murder of John George O’Neill. George Auburn is described as a mechanical expert and well-connected in the automobile trade. On 5 April, he had engaged a driver to take a trip to Wagin with a party which included his girlfriend, Miss Sadler, and they stayed overnight at a hotel. That evening, George Auburn left an overcoat at the hotel which the publican handed over to police. This jacket is found to belong to the murdered man, and subsequent evidence produced by detectives leads to the arrest of George William Auburn for the murder of John George O’Neill. The case goes to trial at the Supreme Court on 10 June 1924. George William Auburn arrives manacled in a ‘Black Maria’ accompanied by guards. The jury is assembled and there is an official list of 53 witnesses to give evidence. A large crowd gathers for a glimpse of the prisoner and to secure seats in the public gallery. 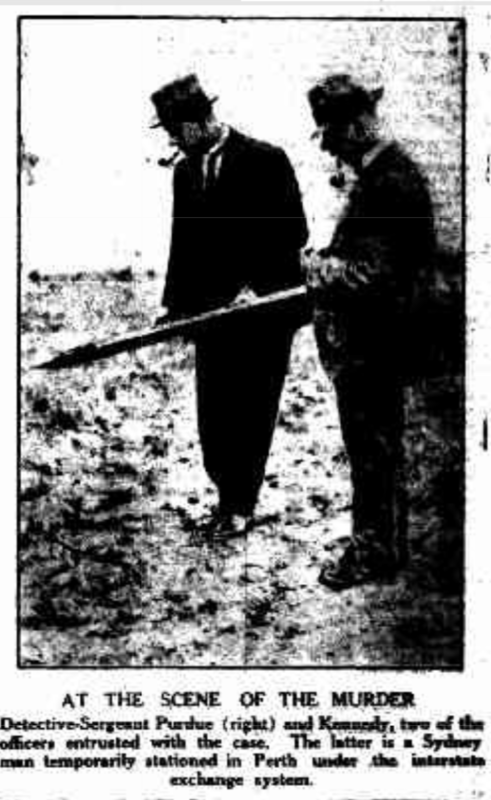 The prosecution claims that it was Auburn who hired O’Neill as a driver on the fatal night of 4 April 1924, smashing his skull with a metal bar on an isolated road in Nedlands, and then dumped his mutilated body in the Swan River where it was found at Crawley. Auburn pleads not guilty to the charge of wilful murder. Significant evidence that connects Auburn to the murder is his possession of John O’Neill’s coat that was turned in to police at Wagin, and also his knowledge of the murder location. Assisting the detectives, Auburn volunteered to show them a place between Claremont and Nedlands where he speculated a car had run off the road. On investigating the place, detectives found marks that showed where something had been dragged, and there was blood in the bushes. Great significance was also attached to the trip Auburn made to Wagin next day by car. Other evidence against Auburn includes testimony from the Government Bacteriologist who found human bloodstains on a hat and coat belonging to Auburn as well as on a button found in O’Neill’s car. Tailors were able to match the button found in the car to a coat belonging to Auburn which had a button missing, and Auburn’s attempt to wash his blood-stained apparel further incriminates him. 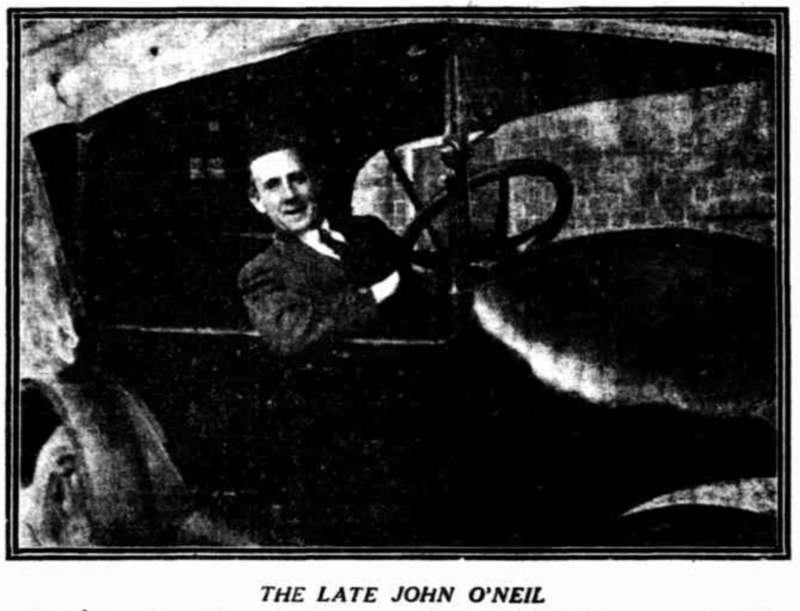 In response to evidence against him, Auburn has always claimed he retrieved O’Neill’s coat from a road after it had been dropped from a motorcar. He found the motorcar tracks in Nedlands while riding out on his motorcycle. The human blood on his jacket was due to an injury to his arm, he always did his own washing, and the button on his coat had been missing for a long time. As for the trip to Wagin, Auburn states this was normal, since he owned and part-owned several vehicles, and also had access to his father’s car. Throughout the trial, Auburn’s appearance and demeanour is described in detail as handsome, immaculately dressed, calm and composed. He exhibits no outward signs of emotion during the proceedings and is silent during sentencing. By contrast his father, who attends the trial, is visibly distraught and cries out when the sentence is delivered. George Auburn Sr is a respected citizen in the Perth community as former licensee of the Tower Hotel, Bedford Hotel, and lately the Osborne Park Hotel. George William Auburn is his younger son. According to the Truth, the evidence brought against Auburn, even if it was true, only proved that he ‘knew something’ about the murder. Detectives believed George Auburn had something to tell and offered him the chance to be charged only as an accomplice, if he would provide information about the crime. However Auburn continued to maintain his silence about the murder, possibly under the mistaken belief that a jury would not fix him to a crime he did not commit. Detectives subsequently allowed him to suffer the consequences of his silence, leading to his conviction for murder and sentencing to life in prison. Reporting the story, the Truth surmises that Auburn probably knew more than he told, but that his silence does not make him the murderer. Had Auburn initially told all that he knew, he could have been eligible for the free pardon offered. However, even after Auburn speaks out from prison, he still offers no information that could help secure his release. The Truth reports: Innocent or guilty? Reporting in the paper also draws attention to the cross-examination of Detective Sergeant Purdue at the trial indicating that, on the night of the murder, a party of people were in the motor car, including a woman. Something occurred to arouse the driver’s disapproval and a person in the back of the car subsequently struck the driver. The Truth further speculates that the two sets of tracks Auburn spoke of included a woman’s tracks. Over subsequent years, reports continue in support of Auburn and he still has hopes of being released. In July 1936, he is granted permission to visit his sick mother and steps outside of Fremantle Prison for the first time in 12 years. In June 1944 George William Auburn is released from prison, as a result of a recommendation by the Executive Council. During his time in jail he has been a model prisoner and aside from any legal considerations, there is support for a review. When George Auburn steps outside again, it is 20 years since he was first arrested and he is now 42 years old. In prison, Auburn has kept himself apart from other inmates and led an exemplary life as the prison librarian and cinema projectionist. In addition, he has studied developments in aviation and motor engineering through access to technical books in prison, while also taking charge of the prison’s electrical systems and mechanical installations. On 27 January 1945, George Auburn, who is described as a sound engineer, marries a hair salon proprietor based in Perth, Mrs Vicky Alice May Robertson. On 22 August 1948, The Sunday Times reports a Mr and Mrs George Auburn, who are partners in ‘Inland Hairdressers’ a mobile hairdressing salon, will soon embark on their first venture to the country when they leave for the South-West. The mobile salon is equipped with fans, motors, driers, radios, electrical hairdressing equipment, and has its own generator. The article reports that Mr Auburn, who is “a well-known figure in the city”, is responsible for the mechanics and automation behind the business venture.